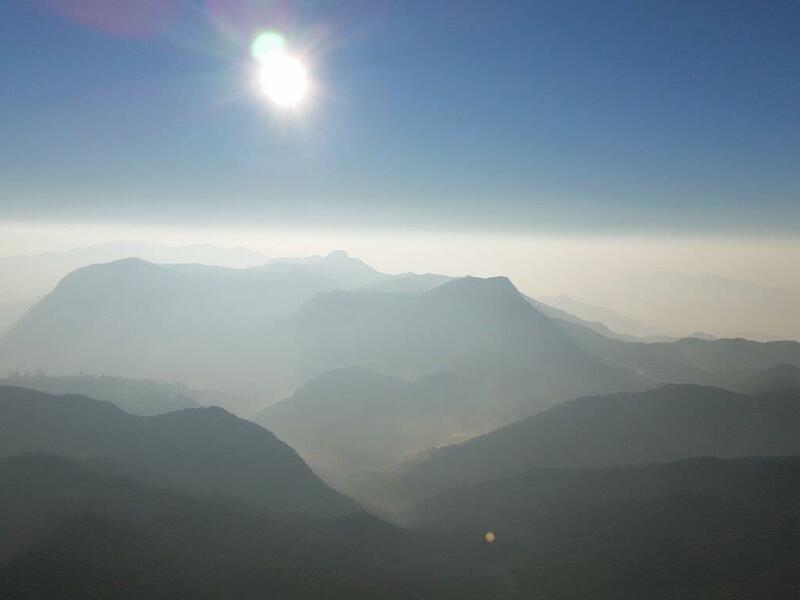 Three hours uphill hike, 5831 steps to the altitude of 2243 meters above sea level, numerous places to stop along the way, beautiful colourful sunrise, a magical shadow, and walk like a penguin for a few days. That is the package you get doing the hike from Delhousie to Adam’s Peak. But it is so worth it! 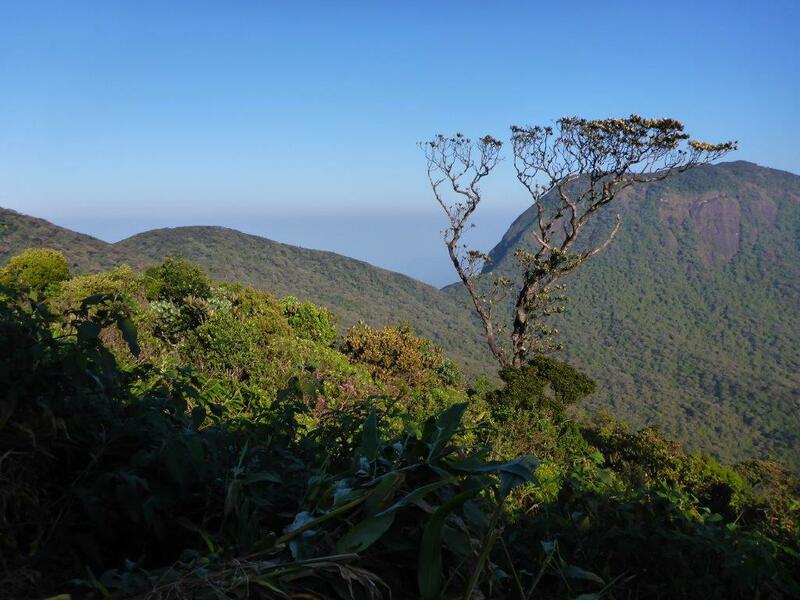 Hiking to Adam’s Peak, or Sri Pada as it is also called, is a very popular hike for tourists and locals alike. 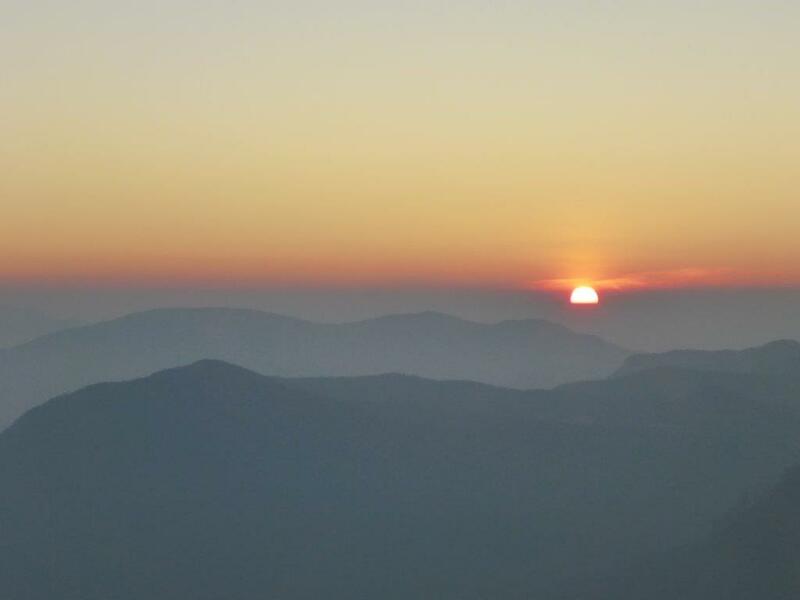 The mountaintop is an important point of pilgrimage for both Buddhists, Hindus, Islamic and Christians, so you will not walk alone. 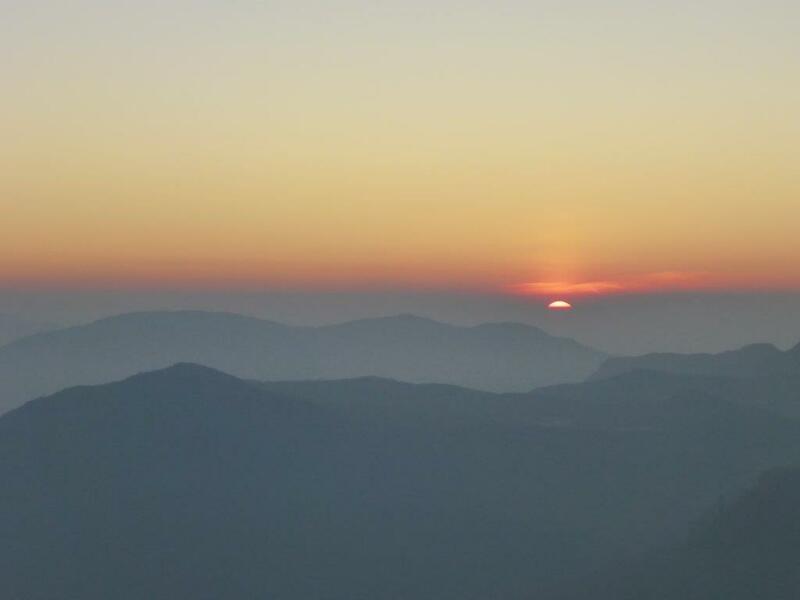 Most people aim to get to the top in time for sunrise, so prepare for an early start. We started from our hotel Wathsala Inn just after 02.00 to be sure to get there in time. 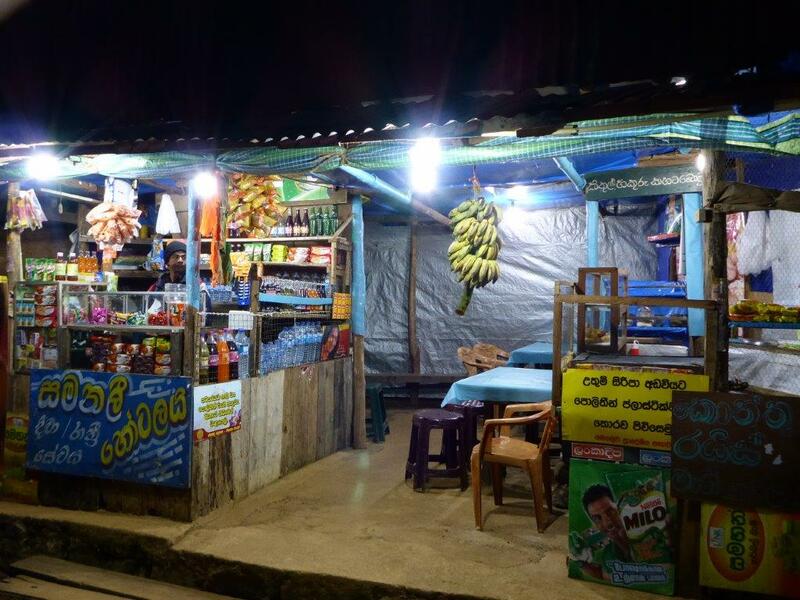 During our travel, we had met several people that had already hiked to Adam’s Peak, and got tips that there were plenty of small stalls selling food, snacks, tea, water and other drinks, so there is no need to carry more than you have to. You should save the space in your backpack for warm clothes to put on when you reach the top. Believe me, you will need them! Anyway. 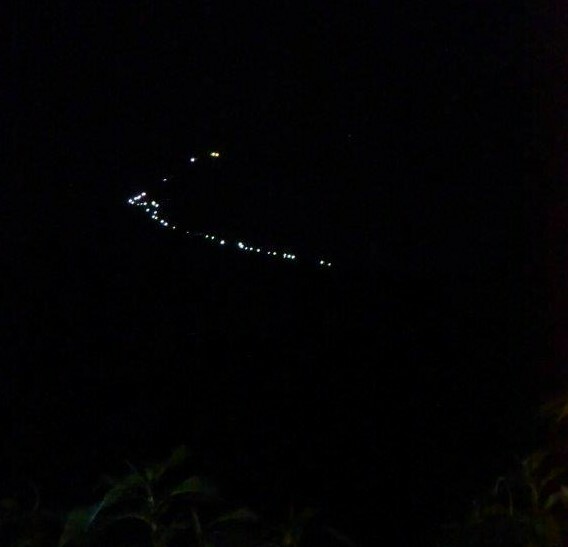 The first part of the track was quite flat and easy, but seeing the illuminated tracks in the far distance, making its way along the steep side of the peak, made me come back to reality and facing the fact that we had a long way ahead of us. The only thing to do is take one step at a time, at your own pace, and taking as many breaks as you need along the way. 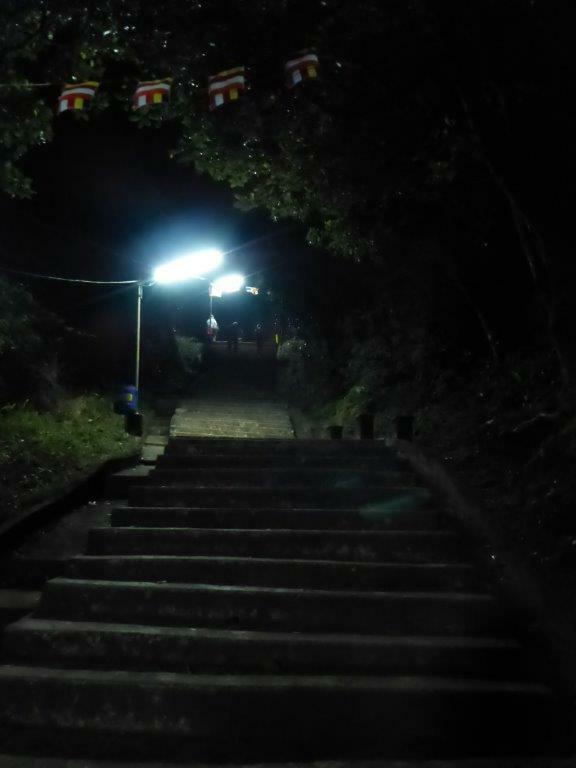 Adam’s Peak with the lit up trail. One of many small shops selling food and drinks on the way to the top. 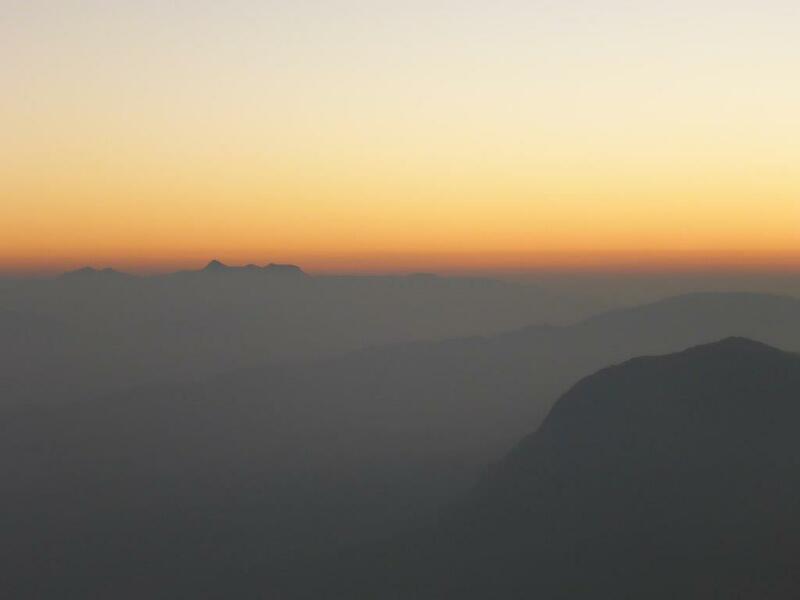 About 10-15 minutes from the top, there is a teahouse where many people gather to wait until it is time to go to make the top before sunrise. You would want to be one of them, as it is freezing to wait up at the very top. A nice and warm cup of tea is also advisable. Bear in mind that the top is at 2243 meters above sea level, the sun is not yet up, and there are few places to hide from the sneaking draft. Walking the last steps, we could see the colours of the sky changing. Reaching the top, we had to remove our shoes as it is a sacred place, so I am very glad I brought woolen socks. 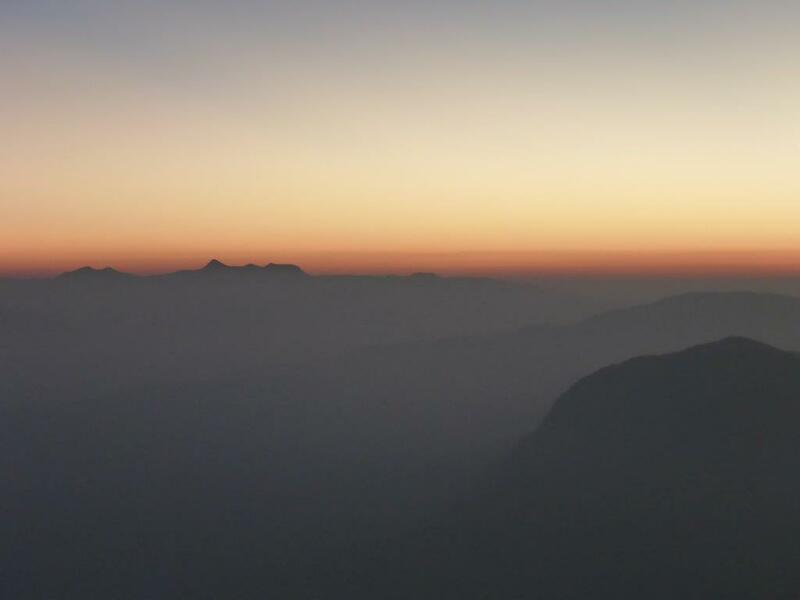 Waiting for the sun to rise was fantastic, with the hills revealed one by one, as the horizon got brighter. And then, the moment when the glowing red sun broke through in the distance. Beautiful! But, there was more to come. 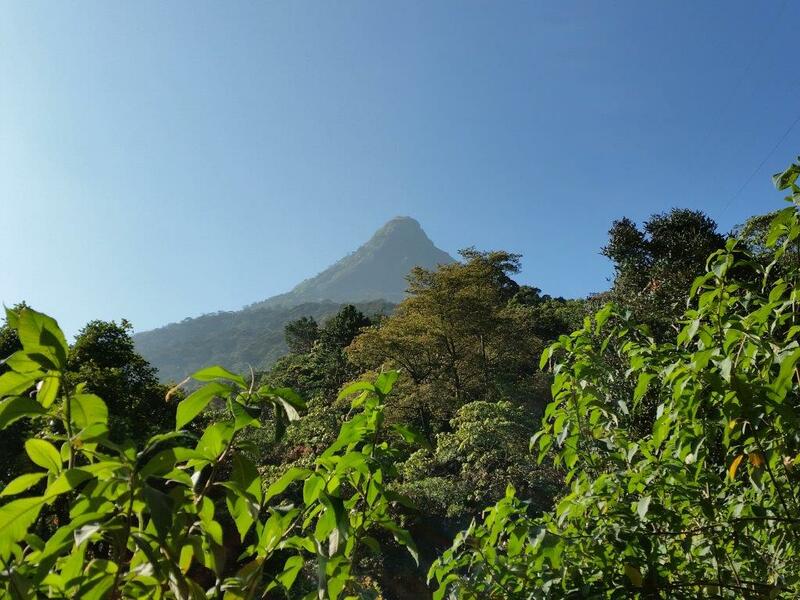 As the sun rises, Adam’s Peak’s shadow is exposed, looking like a soft grey pyramid. A true magical sight! 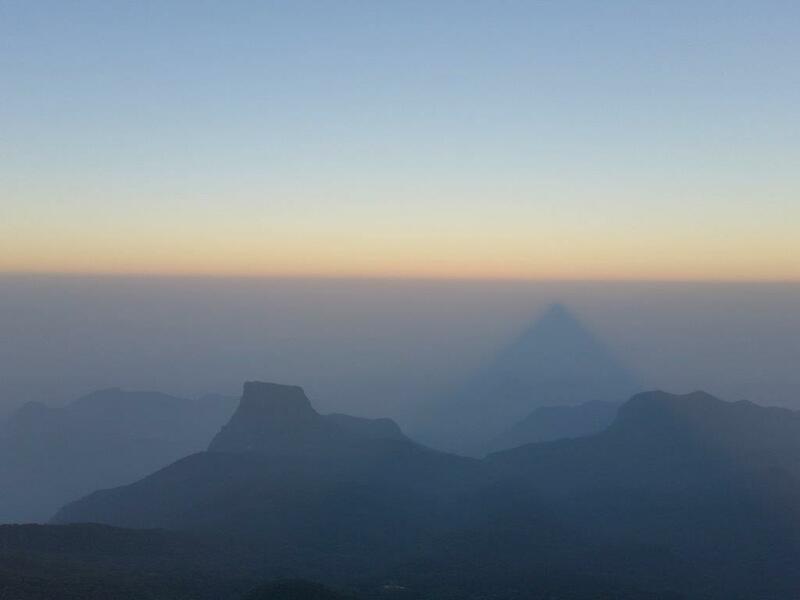 The shadow of Adam’s Peak seen from the top at sunrise. 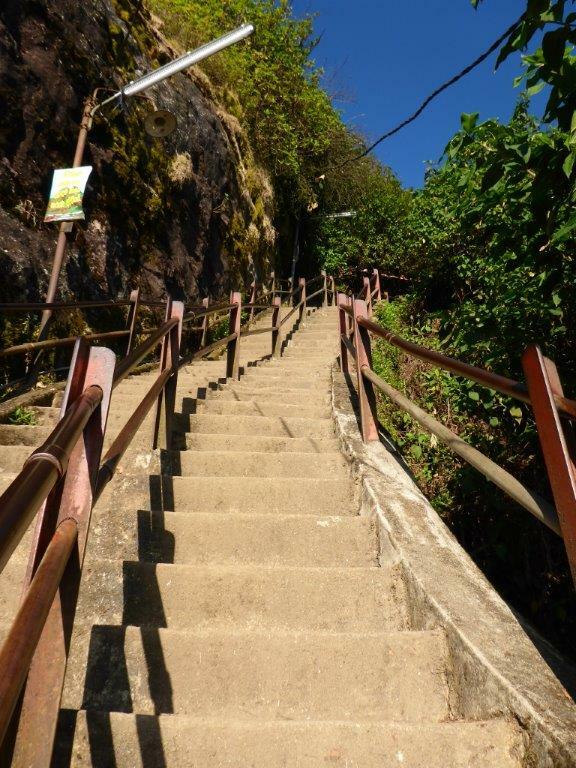 The last part of the stairs leading to the top of Adam’s Peak. Fill it with warm clothes, preferably wool, and definitely thick woolen socks. Buy your drinks along the way so you do not need to carry them. There are no fixed prices, so you should know approximately what it should cost. It is cheaper in the beginning, but closer to the top we paid 100 for half a liter water. However, one of the others we met had paid 300. Don’t push yourself too hard, it is better to take your time and walk slowly. Change your inner shirt with a dry one at your last stop before the top. Keep in mind that the top is a sacred place. Even though the weather forecast say there will be no wind, it probably will be quite a cold draft. 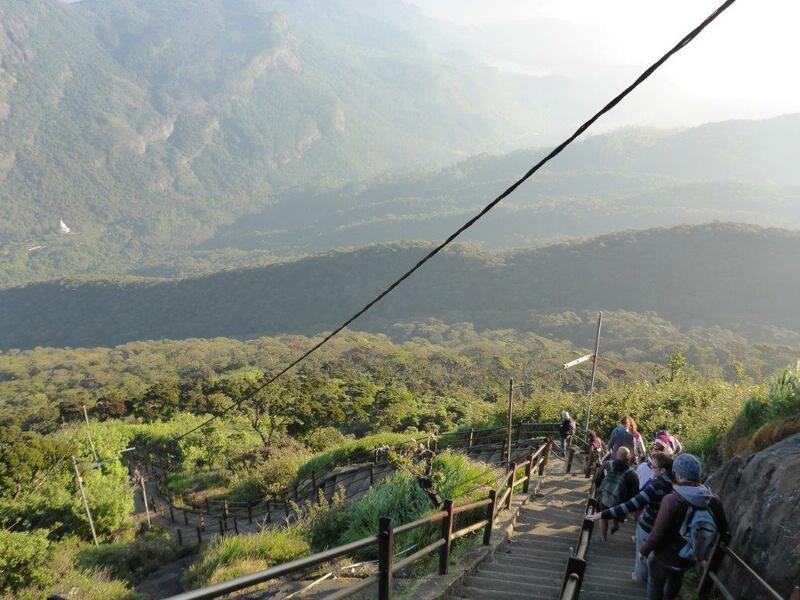 Remember you are walking down the same way you came up, and your legs will probably be quite tired, so walk slowly in the steep steps.